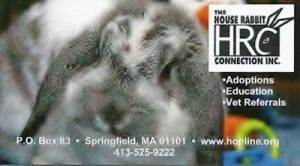 How to Adopt a Rabbit - House Rabbit Connection, Inc.House Rabbit Connection, Inc. Adoption Fees: $60.00 for a single rabbit/$110.00 for a pair of rabbits. All rabbits are socialized, spayed/neutered, and litter-box trained. Please email us at info@hopline.org or call us at 413 525-9222. Our phone line is arranged for voicemail only. A HopLine Educator will be in contact with you within about 48 hours and we look forward to speaking with you about giving a rabbit a forever home. Our Facebook site offers community conversation and guidance. Come join!